So last Monday, we had the pleasure of spending a half day fishing with Capt. Bill Toelstedt off of Nantucket Island. Having spent many an endless day fishing during my childhood, and coming up completely empty handed each time, this fishing trip was an absolute thrill. 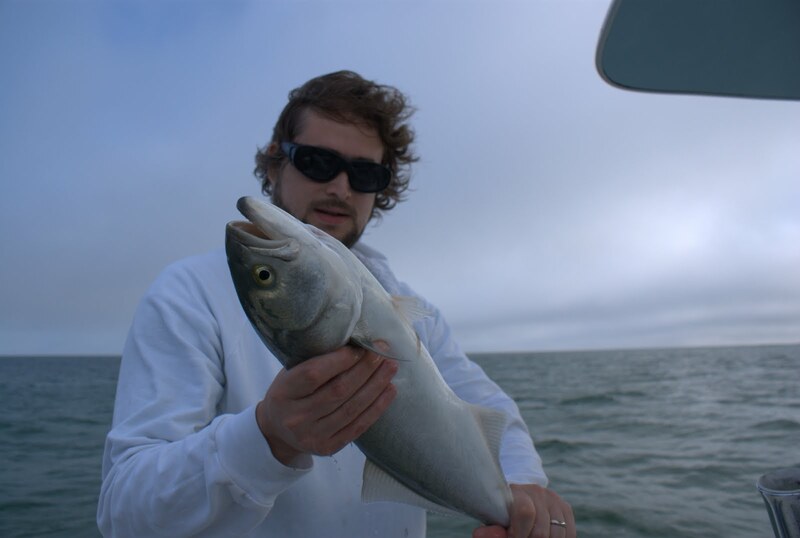 We went out on a 23 foot vessel with this experienced fisherman, who guided us through waters off of Nantucket, eventually chasing flocks of birds who apparently knew exactly where the fish were spending all their time and energy chasing sand eels from the bottom. 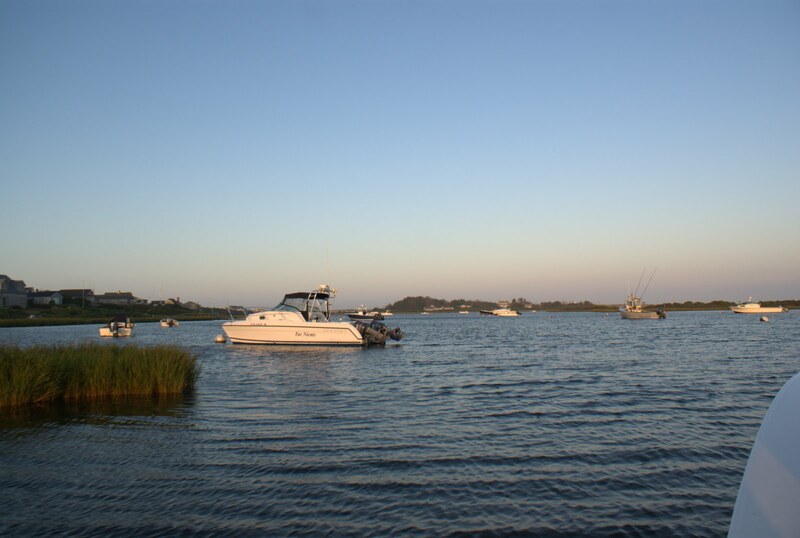 Within a few minutes after heading out, sometime around 6:30 am, we were aggressively skimming the waves on our way to Great Point, and had found the mother load school of blue fish. It was insane. We must have caught about twenty fish, and on a few different occasions, all three of us had a fish on the line. There were so many of these damn suicidal things that I got all tuckered out, and eventually had the very patient captain casting out for me, as fish seemed to hurl themselves onto the lure. We threw all the fish back, except for two big ol' blue fish, that would be filleted for us by Capt. Bill, and brought back to our rental house for a serious smoked fish dinner. 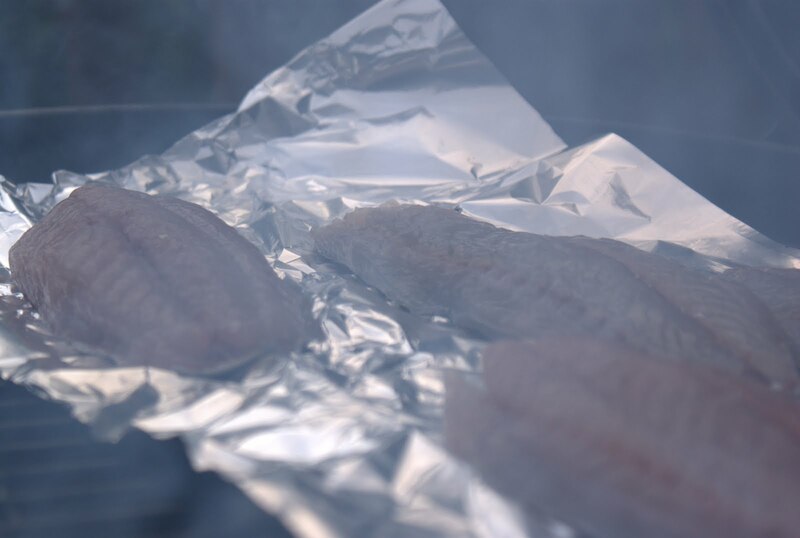 So to smoke your blue fish, the first thing you'll want to do is brine your fillets. Using a half cup of sugar, a half cup of salt, and a handful of peppercorns, cover this concoction with water, and heat until everything is dissolved. Once thoroughly combined, remove from the heat and allow to cool completely. Soak your fish in this mixture for three hours, then remove and dry on a rack in the fridge until dry. Now for the business of the smoking. Start out with a simple charcoal grill, and heat your coals in a chimney until they glow red. While waiting for the coals to heat up, you'll want to soak mesquite wood chips in water, about four cups of chips total. When the coals are ready, throw them all into one side of the grill, and place your first batch of chips, about a handful, directly on top of the coals. Place the fish on top of a sheet of foil on the other side of the grill, away from the side filled with the coals and chips. Pop on the lid, and you'll want the lid vents almost completely closed so that the temperature of the grill is as cool as possible without having the coals go out. Allow the fish to smoke, adding an additional handful of chips about every half hour in order to ensure that the smoke continues to fill the grill. You'll want to smoke your fish for about an hour to two hours, and simply monitor the fillets to make sure that the fish grows golden brown, still remains juicy, and doesn't over cook. Our sweet spot for the four fillets was at about 1 1/2 hours. Blue fish is a wonderful smoking fish, as the flesh can sometimes be too oily for regular cooking, and it's especially wonderful when they've jumped out of the water earlier in the day. 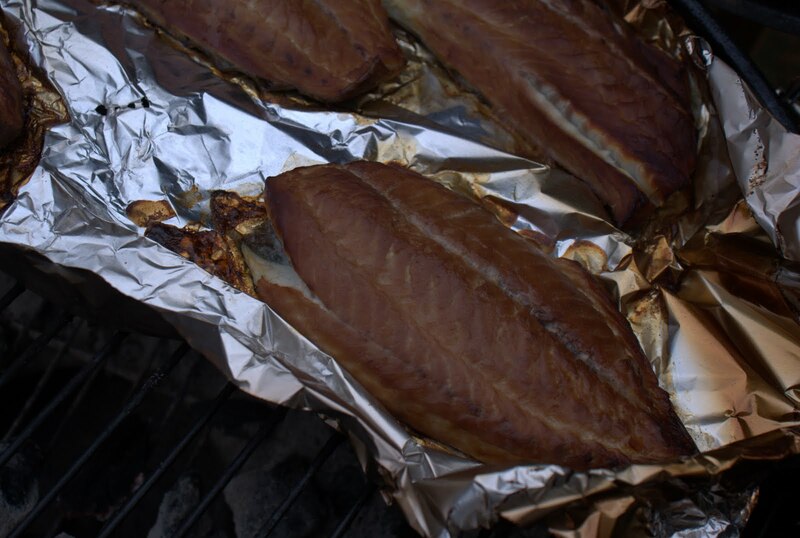 Our fillets were smokey, flaky, golden brown, and had that fantastic essence of the sea. If someone doesn't like seafood, I'm convinced they still could enjoy the smokey, slow cooked flavor of a blue fish prepared this way. You still have time, get fishing and smoking today.